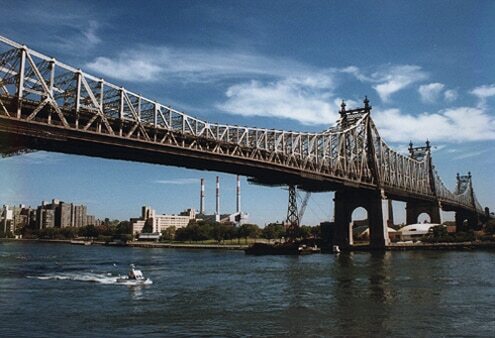 Queensboro Bridge Safety Concerns Noted By Queens Car Accident Attorney - Pulvers, Pulvers, Thompson L.L.P. The Ed Koch Queensboro Bridge exit ramp that has been the scene of a number of traffic accidents was the site of another crash on September 9. At about 2 a.m., a Ford Focus hit a guardrail and a concrete barricade along the exit ramp. The vehicle then flipped as it careened into a storefront. The driver was a 36-year-old female that was a New York City police officer. The mother of two had resided in the Bronx. The officer succumbed to her injuries, and unfortunately was pronounced dead at the scene. The same exit ramp was the scene of a pedestrian fatality in 2011. In that incident, an allegedly intoxicated motorist struck and killed the person on foot. Approximately 10 days after that accident, another driver allegedly lost control on the ramp. That motorist did not survive. Then, in 2012, a taxi driver hit scaffolding that was erected in the same area. The bridge was originally designed to be straight at that point. Now, it curves so that vehicles head in the direction of both pedestrians and various storefronts. Partly in response to those previous crashes, the New York Department of Transportation had installed rumble strips and changed traffic patterns. The DOT also limited speeds and erected Jersey barriers in a further attempt to enhance safety. However, after this most recent fatal event, a Queens councilman observed that cars had “flown” into the same store on multiple occasions. He claimed that it was not true that everything had been done to make the ramp safer. He questioned how anyone could describe the area as “perfectly safe.” Now, State Sen. Michael Gianaris is demanding a full overhaul of the ramp, partly in response to owners of stores that have been hit in these various crashes. Traffic accidents happen for many different reasons, including unsafe road designs. A Queens car accident attorney that concentrates in relevant areas of the law can often help an injured party or survivors of a deceased motorist to assess any questions of negligence that may arise. To discuss the particulars of a car accident that you or a family member may have been involved in with a Queens car accident attorney, please contact us.